Being an gamer of legal drinking age has it's benefits. For starters I can enjoy the occasional Mario Kart drinking game, though really I just enjoy being able to break out a drink while starting up a game. Now there is a whole site dedicated to video game themed drinks and mixes which you can check out. (my favorite post there is the "The Drink is a Lie," a Portal themed cocktail) The problem is I'm not much of a mixed drink guy. That's generally because I hardly ever have the needed ingredients and I don't have the money to keep the supplies in stock. I prefer just keeping a bottle of something in my fridge to pour myself a glass when I want it. Through a story that can be summed up as, "Google sent me," I discovered these video game themed beverages. Two wines and two beers, all nerd. A red Zinfandel by Woot Cellars made in California, 2007. 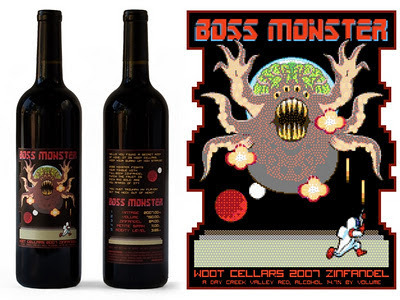 The name is a bit of a pun as a "monster Zin" is a wine with a high alcohol content, and Boss Monster sits at 14.4%. Online reviews seem to enjoy it, saying it was fruity and bold though some suggested decanting. Priced at $60 plus shipping for a six pack, though sadly as far as I can tell this wine is no longer available. 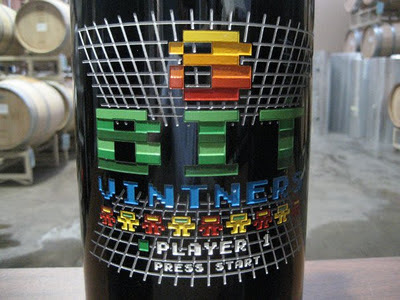 A red blend by 8 Bit Vintners made in Washington, 2007. Player 1 is an obvious video game reference, though really I think I'd rather drink with with friends than solo. Players 1-4? Reviewers seemed to like it as an everyday wine. Smooth and fruity with a good finish, though a bit of a mish-mash of grapes. This was sold in a four pack for $49.99, this one has been put on pause indefinitely by the creator. That's the first half of this blog post, next up are the nerdy gamer beers found to exist. Please remember to drink and game responsibly.